Oltre il limite concerns the awareness of the limits that prevent us from experiencing the full reality. This boundaries are represented in the performance by a large white cloth. The art piece, through poetry, images on slide, shadows, music and gestures, leads to ‘break’ the limit of appearance and go beyond the constraints that prevent us from living the deep and authentic side of the existence. 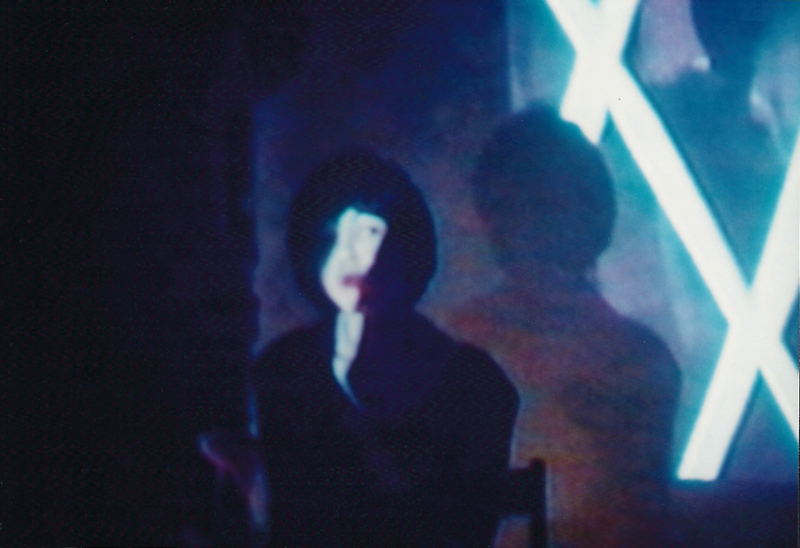 The scene is occupied by a large white cloth, on which are projected the images. 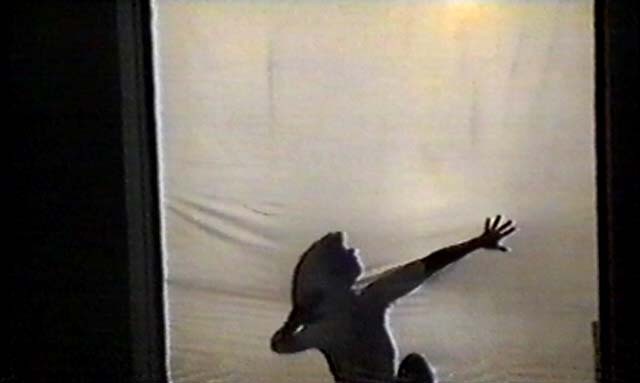 At the beginning the performer is hidden and imprisoned behind the curtain, we hear only her voice and sometimes, we see her body moving through the back lighting that creates the effect of shadow puppetry. Gradually, however, the fabric is cut, slowly revealing hands, arms and so on, until the whole body of the artist appears. 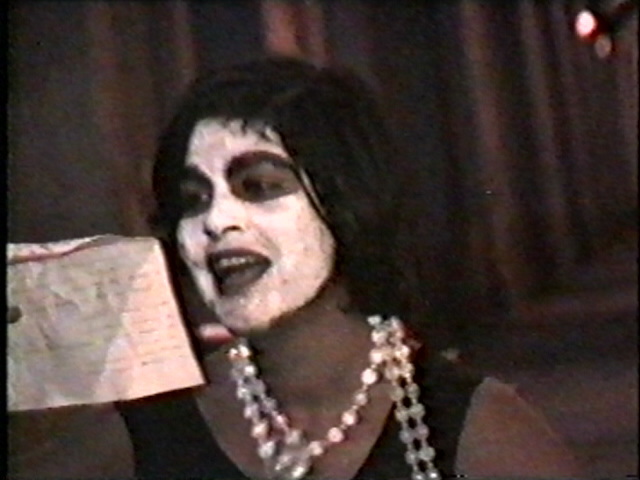 Percorso is a collaborative performance realized by LIUBA and Francesca Amat at Galleria Avida Dollars in Milan in 1998. 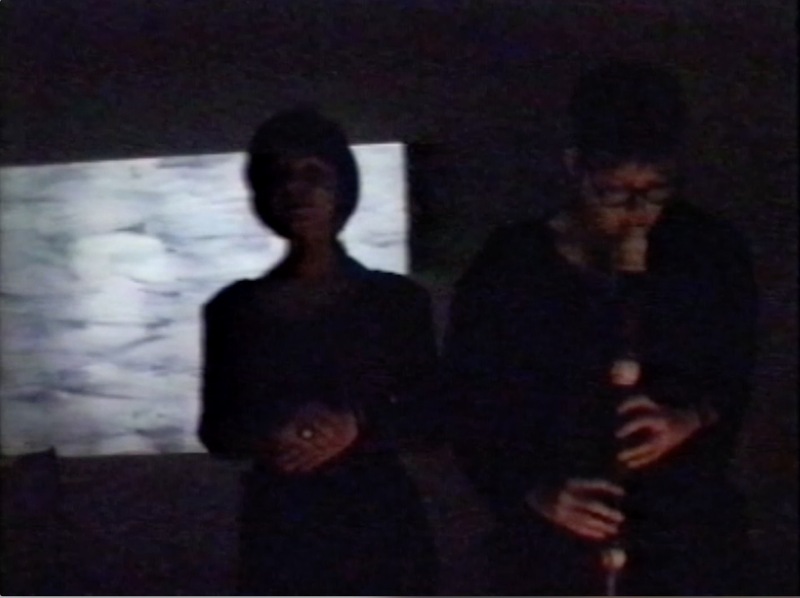 The performance piece is a duet and a path (percorso) of self- consciousness through obstacles and pain developed with different media intersecting and overlapping each other. And the daisy became sad, for she knew that she could not change the color of its petals and no one wanted her, because she did not fit into any box . ” Maybe I should really choose only one color? ” thought discouraged. But then one day appeared an elf who took her in the center of the earth, in a country full of colors, and there she found many goblins colored daisy, who taught her to be proud of its petals and go around the world to bring the scent of her colors. But the world was difficult for a colorful daisy . It began the true loneliness, the fear, the anxiety of not succeeding and awareness of the networks in which get caught . Almost no one understood her, and there were always people who wanted to take away her colors, to make it a normal white daisy, like all others, have her pretty secure job, her confidence and her boxes. But Daisy was crying inside the boxes, even though she knew that it was more comfortable to sit in there in the warmth instead of going out in the storm. She also met other colorful elves that helped, but eventually got tired so much that her colors disappeared and she became ill. She arrived in the dark and fever. She do not even know how to heal. But then suddenly there came a white bird that took her to a distant land far away, full of color, dance and sounds … And there, forgetting everything, she began to dance with butterflies, more light, more and more happy … and she realized that gradually reappeared all its colors, and even stronger, and even more beautiful than before, so strong that even if she had imagined, so many that she had never seen. A thread was born from its center, a thread that started from inside, a thread that made the dance of colors everywhere and that no one would stop. The oscillation consists of the non-exclusion of opposites, and in understanding both poles of life’s dualism, leading into an experience of the absolute which is union of opposites, yin and yang, male and female, joy and pain, day and night, earth and sky. The oscillation is an experience of great wisdom, but is provocative, because the current moral is usually trying to make us follow narrow and defined paths, fearing the ‘other’ side of dualism, dark and mysterious. But the sage knows that the experience of the Absolute is an experience of the total, that life is made up of opposites and that there is no light without darkness. The performance ends with the active intervention of the public: LIUBA invites a man of the audience to dance with her, ‘swinging’ their bodies, male and female. 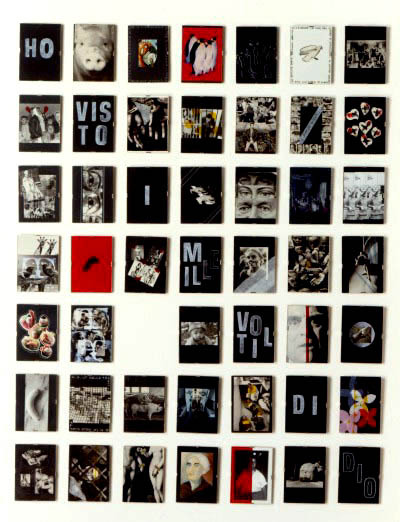 Ho visto i mille volti di Dio is a performance art piece composed by two installations of the artist, which correspond to two different semantic sections. 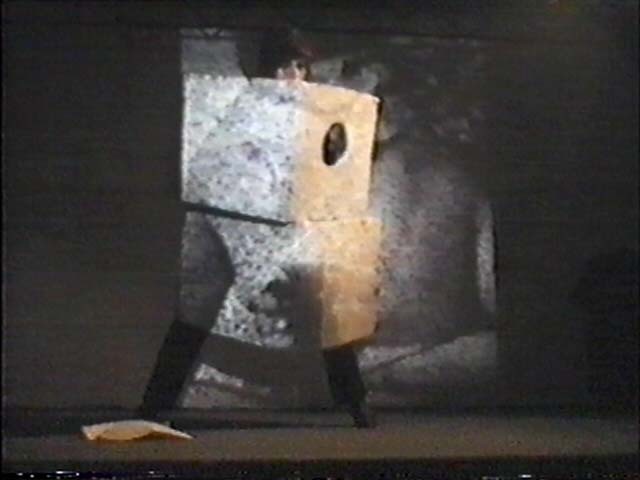 The first part, bodily and dynamic, takes place within an installation by the artist with the form of a frame, in which the artist acts wildly and blindly in search of a way out of her captivity. Exiting the frame coincides with a re-birth of consciousness, the acquisition of a new existence. With reborn eyes the artist can acess a world made of unity and similarities, where is possible to perceive and discover the ‘thousands faces of God’ beyond barriers, stereotypes and individual religions. 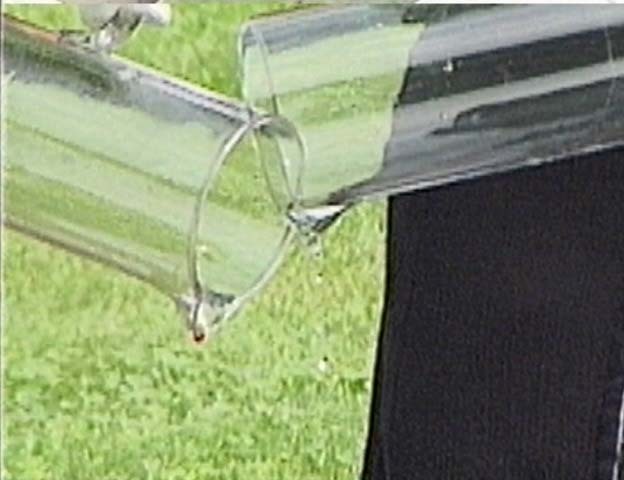 The piece took place during the “Perfomedia” Performance Art Festival in Ponte Nossa (Province of Bergamo). 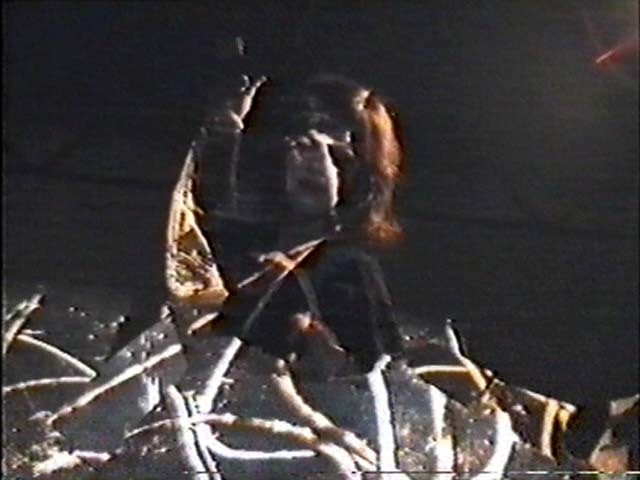 Extract from the videocatalogue edited by the Festival organizers – VHS converted in digital format. Liberazione is an on-going series of works that LIUBA realized over the years, in different locations and using different settings. The starting point of this project is the investigation on the relationship between social constraints and modern life , where people are used to live almost like an automaton, close in metaphorical boxes and constraints which strongly limit creativity, expressions and human potentials. 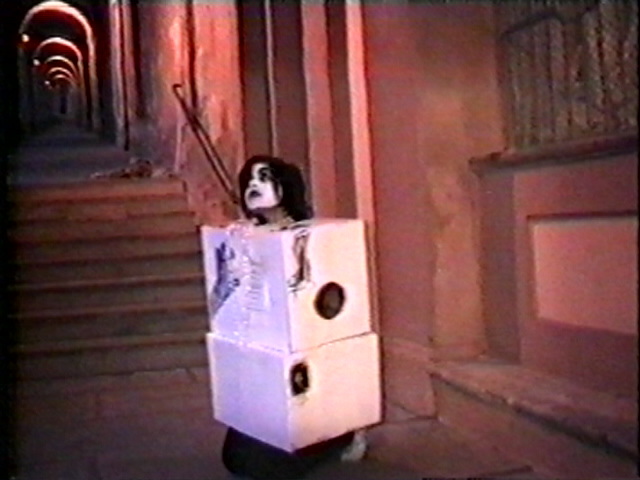 In the two Liberazione performances pieces, LIUBA, dressed in boxes, tries to free herself from this imprisonment. 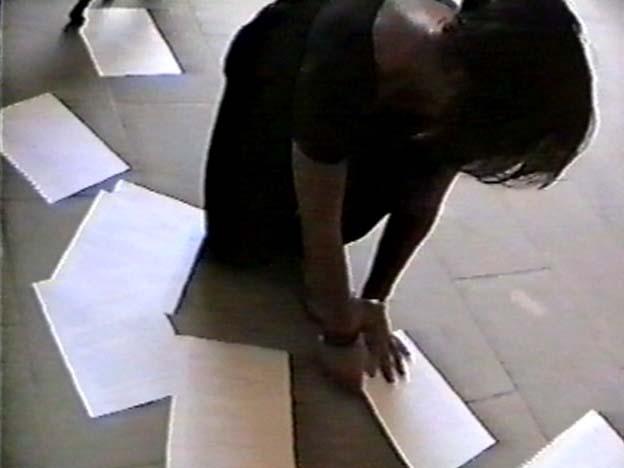 This performance piece has been realized for the site specific “Poetic Pilgrimage” project, which took place in the porticos of San Luca (Bologna). The event, curated by LIUBA, was connected to the broader national event “The Italy of Poets. 100 concerts of poetry “, promoted by the magazine Harta. All the poems in the performance are composed by LIUBA, while the musical incursions are free artistic expressions of the various artists who took part in the Poetic Pilgrimage. 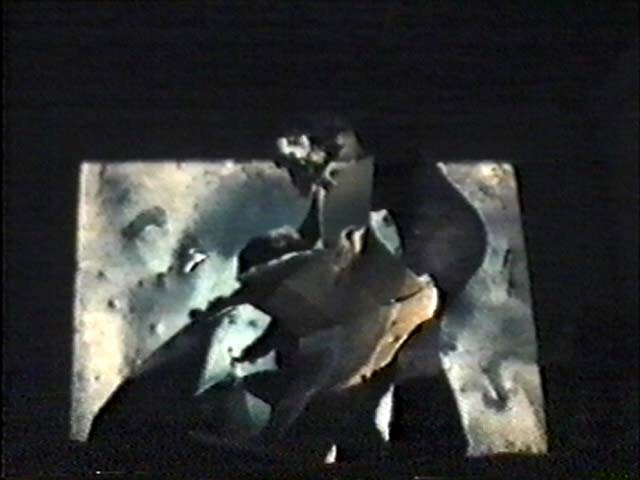 VHS converted in digital format. In this further phase of the research, LIUBA has developed the performance Liberazione (Liberation) by combining different artistic languages, focusing on the multimedia aspect of the piece. 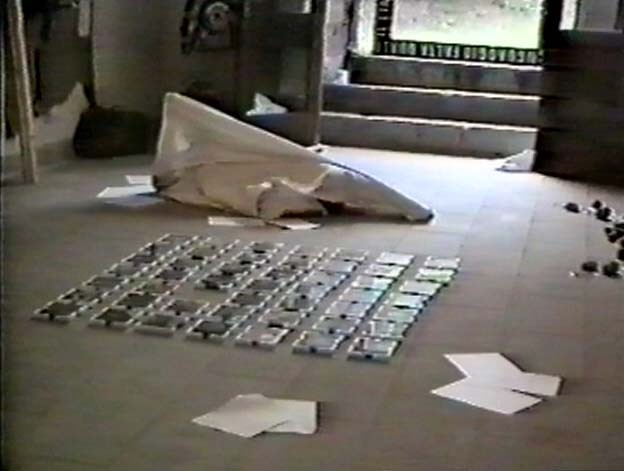 A series of slides taken from the artist’s works and interventions on the film adds to the other artistic languages ​​already present in San Luca’s performance, as well as the music, chosen ad hoc for the piece. 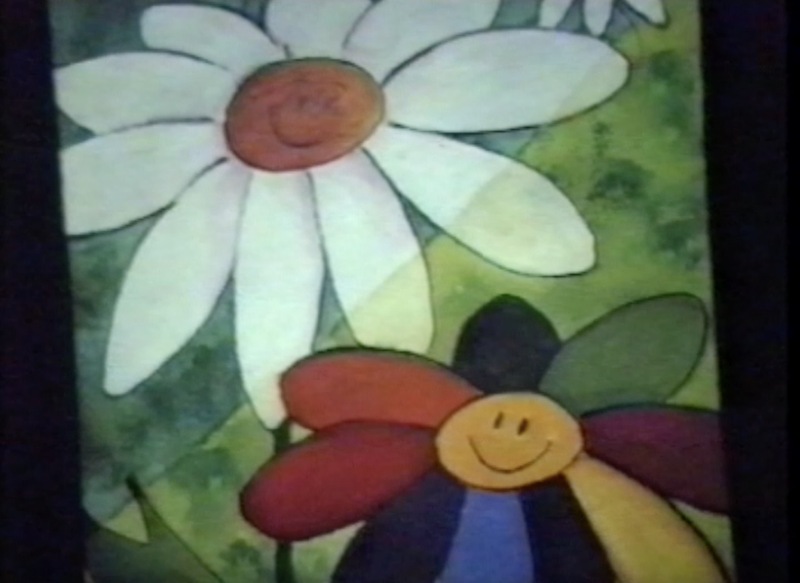 La margherita dai petali colorati (The colorful petals Daisy) is LIUBA’s first documented performance. It was born from the need of intersecting different languages as words (the fairy tale is written by the artist), images, music, gestures, space. The story explores themes as deep as the fear of the diverse that inevitably leads to discrimination, and the preciousness of multiplicity and heterogeneity. music and performed it on stage. Other important elements were the hand made slides created by LIUBA, and a strong symbolism of space, objects and gestures. 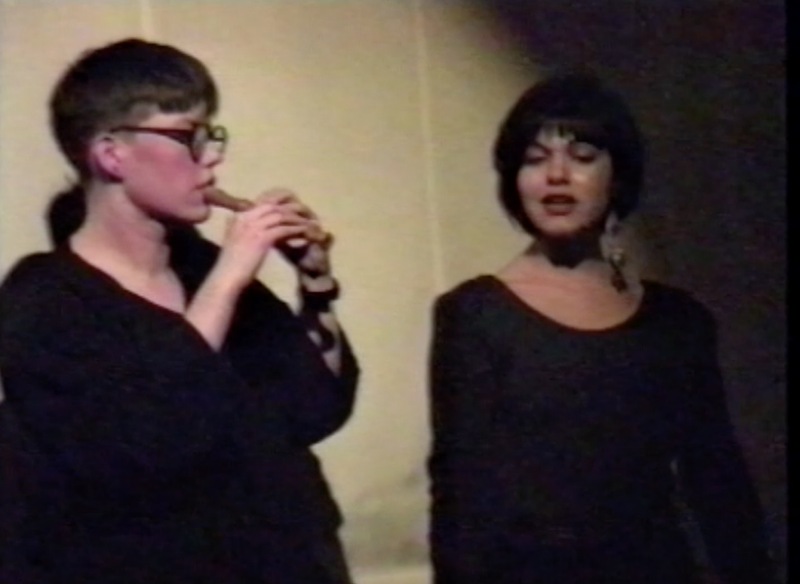 This video shows extracts of some LIUBA’s performances from 1994 to 2000.